This delicious main dish sandwich is a bit calorie heavy, but just tell yourself that all that spinach makes it healthy! Of course, you could always split it with someone, and then it would be light, healthy, and still satisfying. 1 small boneless skinless chicken breast half, about 6 oz. 1. Slice the chicken breast in half, horizontally and place each half between two sheets of plastic wrap. Gently pound the thickest side of each half to even the thickness. Set aside. 2. In a small microwave safe bowl, combine the cheeses and mayo. Set aside. 3. In a large skillet, cook the bacon until crisp. Drain on paper towels and set aside. 4. In the same skillet, cook the chicken in the drippings until done, about 2 minutes on each side. Remove to a plate and keep warm. 5. In the same skillet, cook the onion until it begins to soften, then add the spinach. Toss the spinach with the onion until the spinach just begins to wilt. Remove from the heat and toss with the balsamic vinegar. 6. To assemble, microwave the cheese mixture for about 30 seconds, then stir until smooth. Spread evenly on the inside of the Hoagie rolls. 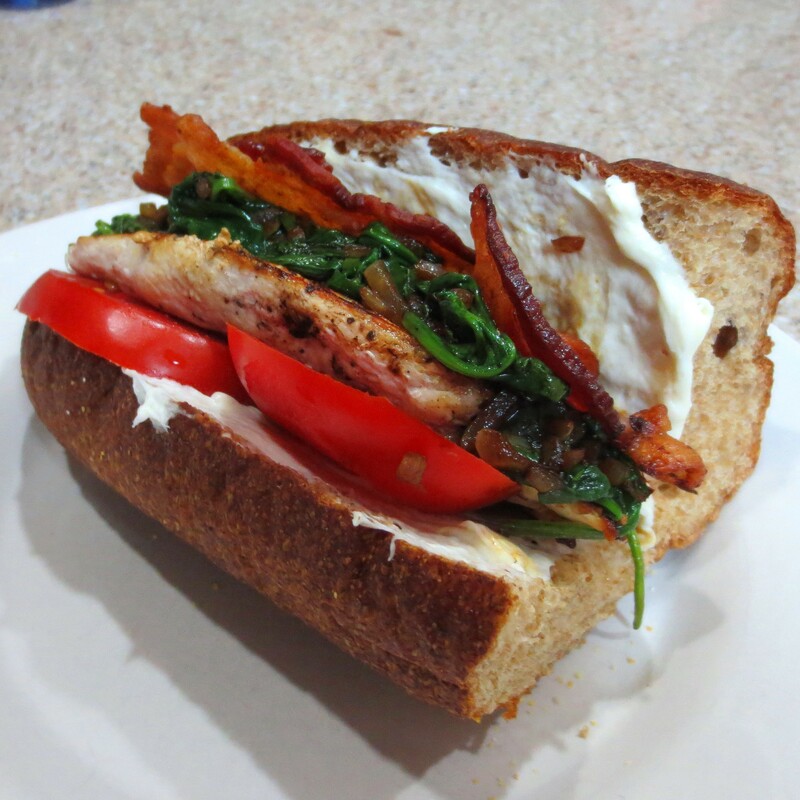 Place 2 slices of tomato on the bottom half of each roll, add the chicken, the spinach and then the bacon.